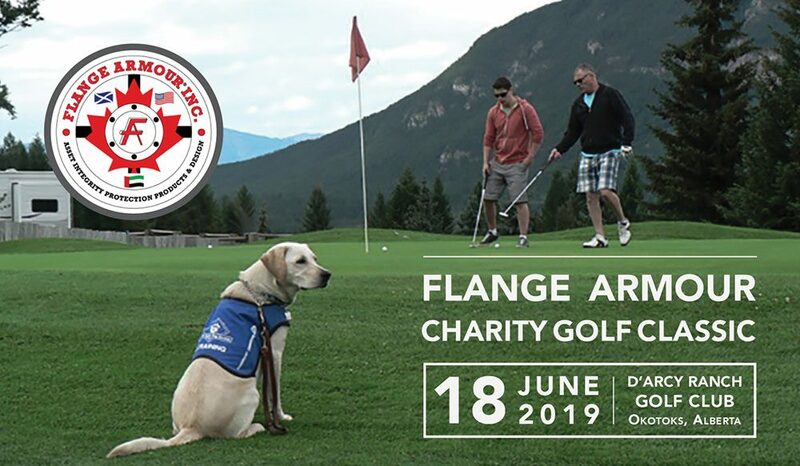 Join us at our 1st Annual Flange Armour Charity Golf Classic on June 18, 2019 at the D’Arcy Ranch Golf Club. This event supports Alberta Guide Dogs – raising funds to meet the growing demand for professionally trained Guide Dogs and Autism Support Dogs for citizens of Alberta. Your $250 ticket includes 18 holes of golf, power cart, driving range access, dinner, silent auction, chance at amazing prizes, and puppy cuddles galore! To register, please contact Alberta Guide Dogs by phone at 403-258-0819 or via email at info@albertaguidedogs.com. Spaces are limited, so be sure to reserve your spot soon! All proceeds from this event will be matched up to 50% through the Shaw Birdies for Kids Presented by AltaLink program. Multiple sponsorship opportunities are available depending on your budget and goals. If you would like to be a sponsor for this event, please contact FLANGE ARMOUR by phone at 587-777-6274 or via email at info@flangearmour.com.